ISaGRAF IEC61131 based Windows embedded Programmable Automation Controller (PAC) with Windows CE .NET 5.0 OS, Ethernet, USB, RS-485 and RS-232 ports and din rail mount. Supports I/O expansion bus. Supports operating temperatures between -25C to 75C (-13F ~ 167F). 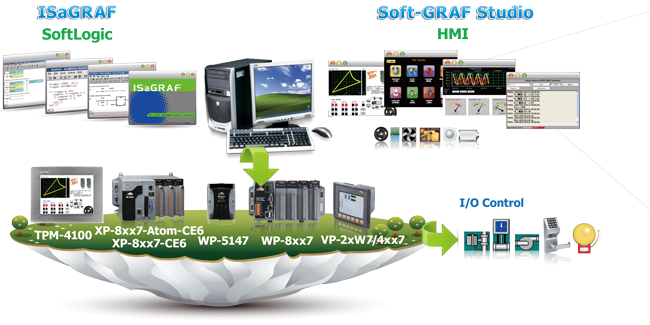 Comes with free SoftGRAF HMI development software and eLogger data logging software. 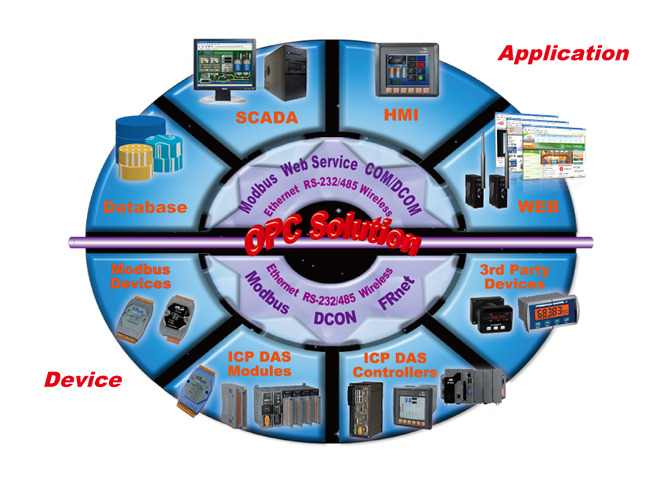 Redundant System with Ethernet I/O Multiple Web HMI - Monitor & Control Everywhere! Modbus TCP/IP Master Link to max. 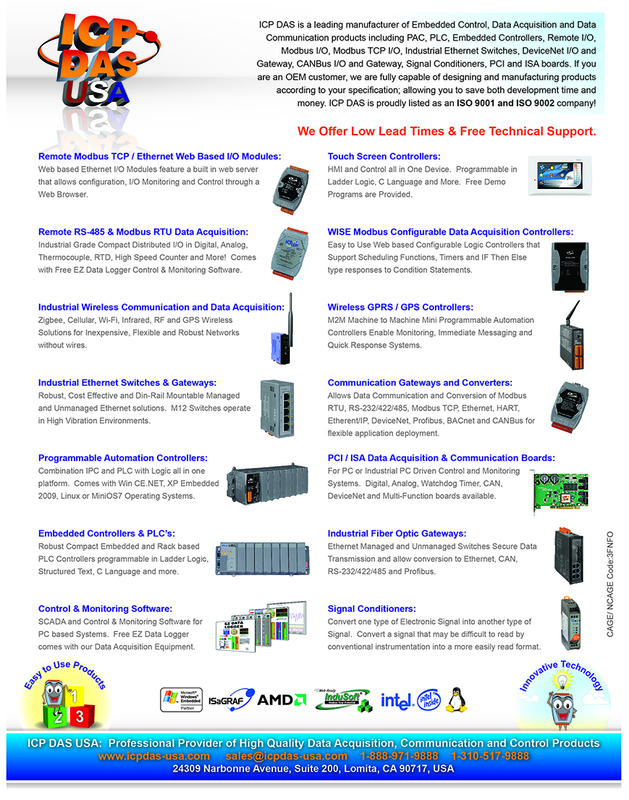 100 devices that support Standard Modbus TCP/IP Slave protocol. Modbus RTU / ASCII master ports to connect many Modbus RTU / ASCII slave devices. Modbus TCP/IP Slave Ethernet LAN1 & LAN2 support total up to 32 connections. When one Ethernet port is broken, the other one can still connect to PC/HMI. User-Defined Protocol COM1 ~ COM3 by Serial communication function blocks. Remote I/O COM2 supports I-7000 I/O modules, I-87K base + I-87K Serial I/O boards and RU-87Pn + I-87K High Profile I/O boards as Remote I/O. Max. 255 modules for one controller. M-7000 Series Modbus I/O Max. 10 RS-485 ports (*) can support M-7000 I/O. Each port can connect up to 32 M-7000 Modules. Send Email Supports functions to send Email with one attached file via Ethernet port. Exchange Message & Auto-Report LAN1 or LAN2 support UDP Server and UDP Client protocol to send/receive message to/from PC/HMI or other devices. Exchange Message & Auto-Report LAN1 or LAN2 supports TCP Client protocol to send/receive message to/from PC/HMI or other devices which support TCP server protocol. Ex: automatically report data to InduSoft's RXTX driver, or to connect a location camera. SQL Client Support SQL Client function to write data to (or read data from) Microsoft SQL Server (2000 SP3, 2005, 2008). CAN/CANopen COM1, COM3 can connect one I-7530 (converter: RS-232 to CAN) to support CAN/CANopen devices and sensors. 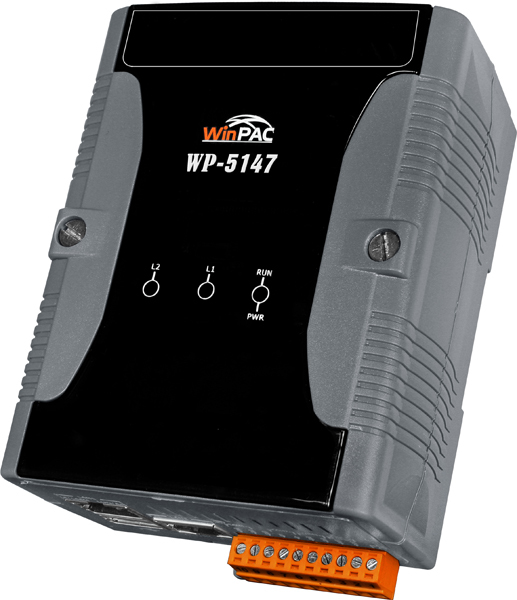 One WP-5xx7 supports max.10 RS-232 ports to connect max. 10 I-7530. FTP Client Support FTP client to upload files in the PAC to a remote FTP server on PC. 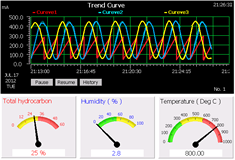 Soft-GRAF’s g_Alarm & g_Logger1 HMI objects support FTP client, too. *Note: COM5 ~ COM12 are resided at the optional expansion XW-Board series if it is plugged inside the WP-5xx7. * Recommend to use NS-205/NS-208 or RS405/RS408 Industrial Ethernet Switch.